I have been wanting to do a design around how I plan, buy, prepare and share foods with my family and friends. This carries on from the my health and wellbeing design that I have been working on for the past year. I have learnt so much from the previous design and met some great people along the way. 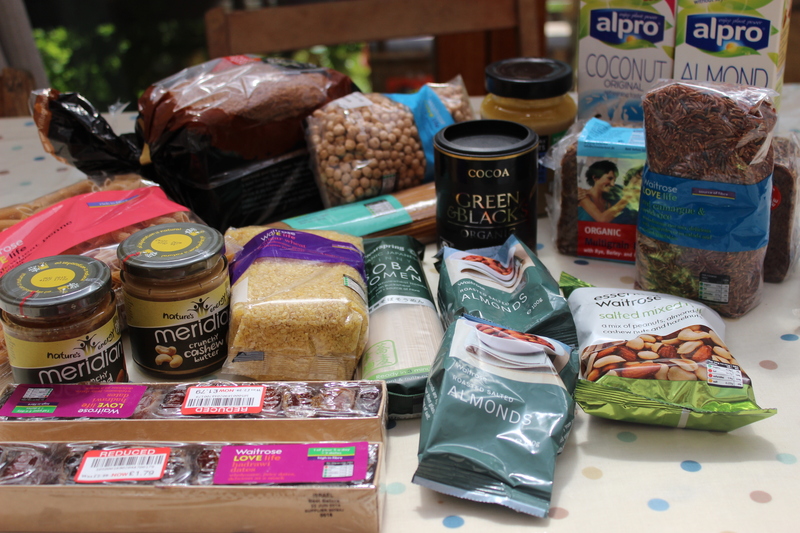 I have been speaking with some of these people about setting up a food group concerned with making bulk food orders and coming together regularly to share meals, recipes and ideas around healthy eating. I have set up a group with six other women, all parents of young children like myself. The diets eaten by this group of women are quite diverse, encompassing vegans, veggies, meat eaters, wholefoodists, grow-you-own gardeners and keen cooks. What we all have in common is a great love of fresh healthy wholefoods and an interest in feeding our families the best possible diets from an ethical source and at a price that we can afford. 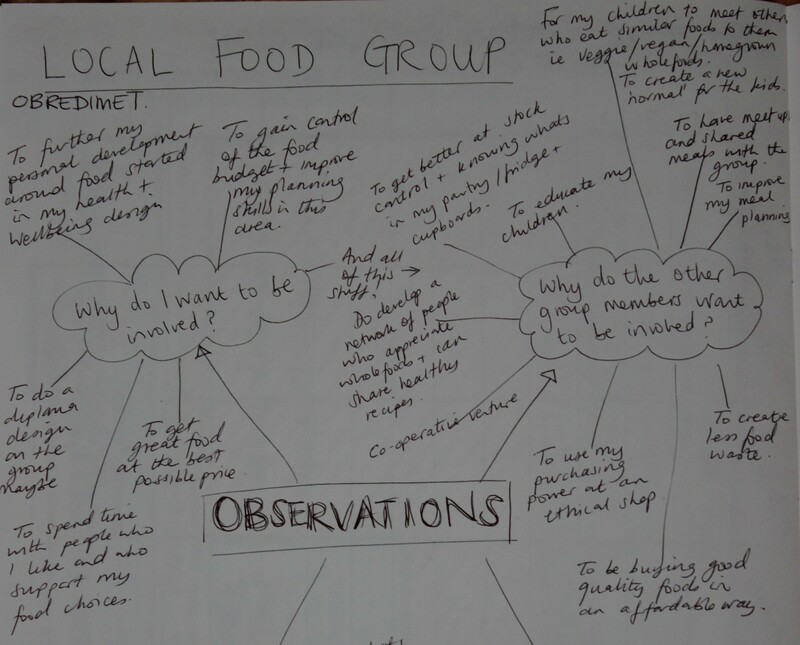 So this design aims to look at how to create a sustainable design for our group to order food in a co-operative manner and to meet up regularly to plan this and share meals. Most of my designs to date have been long, drawn out processes in the planning and writing up stages. I wanted this design to be different so have set myself a limit of ten hours writing up and ten hours meeting with the group to plan. I used the design process OBREDIMET as I am comfortable with it already and plan on using design tools that I am familiar with to use my time efficiently. Via our Facebook group and over informal discussions at meet ups we discussed our current shopping habits, the changes we wanted to make and why we had wanted to be involved in this group. I pulled this info together in the brainstorms shown below. The group was formed with the intention of ordering from Suma http://sumawholesale.com We decided to jump straight in and place our first order deliberately without applying a design to how we ordered. People were in a hurry to order and I thought it would be interesting to be able to see the difference in ease of ordering with and without a consciously applied design process. The first order was placed in early April and we met up again late April to reflect on how we had found the process so far and plan for the future. 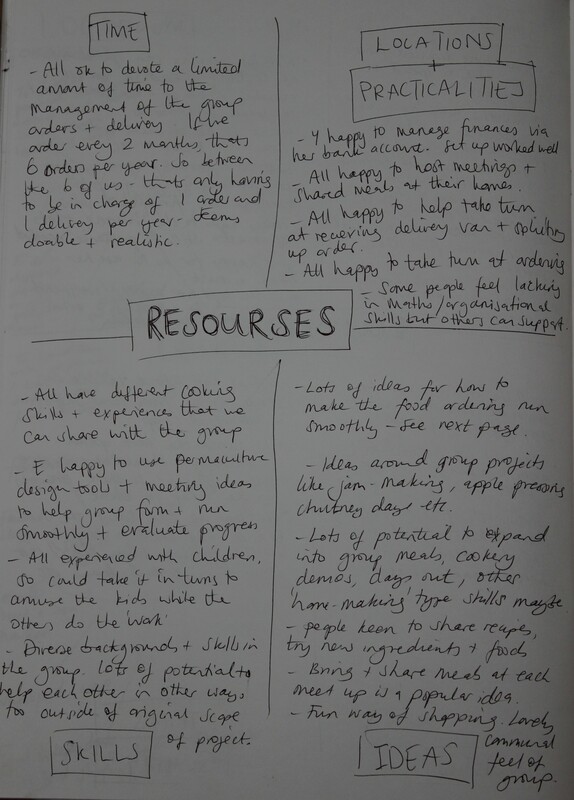 I used the fact-finding tool ‘Gives, gains, grins and groans’ ( which I had used before in a Muddy Boots design after originally adapting it from a tool suggested by Looby Macnamara in her fab book, People and Permaculture) to find out lots of info in a quick and easy manner about how people had found the process of ordering. 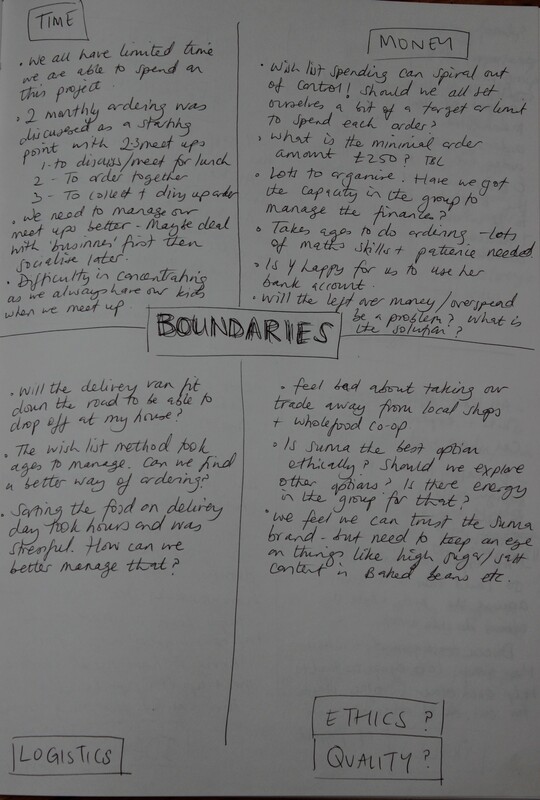 This info was then reformatted as boundaries and resources. 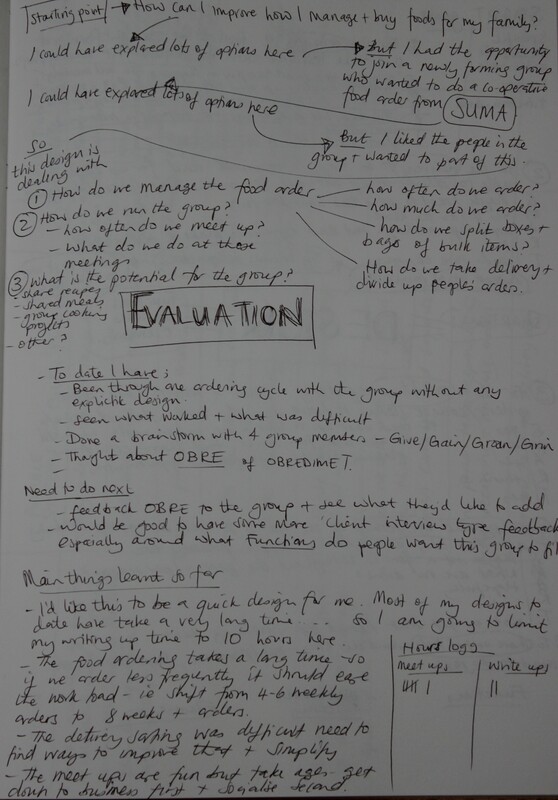 I then carried out a brief evaluation of what we/I had done so far and made a plan for what to do next. A brief evaulation of how the first order had gone was also carried out with the group and is reflected upon in boundaries and resources. To summarise, the food is great, but the ordering took hours and dividing up individual orders on delivery day was a nightmare. 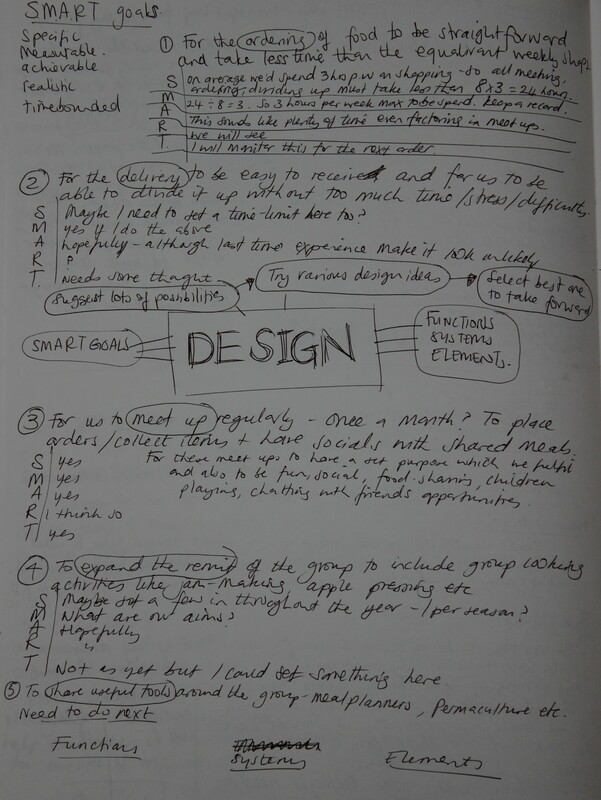 We decided that the design should have five key functions; the details of how to make each goal SMART is still a work in progress at this point. 1. For the ordering of food from Suma to be straightforward to manage and for responsibility to be shared out amongst group members. 2. For the delivery be easy to receive and manageable to divide up on delivery day. The next thing I will do is look at functions and elements and PNI possible ways of achieving the key functions. This entry was posted in Uncategorized and tagged 10 Designs, Adventures in whole foods, boundaries, co-operatives, design process, Diploma, Evaluations, food, food choices, food shopping, OBREDIMET, observations, Permaculture, Permaculture Diploma, resourses, South Leicester food group, Suma by emilycrofton. Bookmark the permalink.